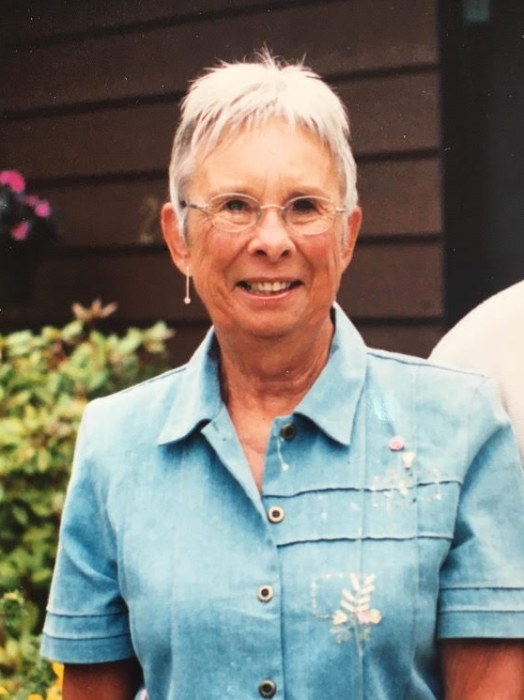 Barbara Elizabeth Smith passed peacefully on April 12, 2019 at the age of 90 years. She is survived by her loving husband of 65 years, Maurice Smith. Lovingly remembered by her brother Rod Sisler (Marianne) as well as her children Susan Power (Ray), Donna Roy (Scott), Douglas Smith and Nancy Lomas (Rick). She also leaves her grandchildren Leslie Power (Kurt), Michelle Brewin (Darek), Philip Roy (Caitlin), Emma Lomas (Tom), Hannah Lomas (Matt), Beth Lomas (Jack) and Keagan Smith-Riach (Hillary), and great grandchildren Grace, Jack, Jamie, William, Amelia and Gus. Barbara is predeceased by her father, William J. Sisler, and her mother, Agnes Sisler (Martin), and her brothers, George, Bill, Jim and sister, Sandra. Barbara was born in Winnipeg and lived there until she moved to Flin Flon in 1953. She loved Flin Flon and raised her family there. Barbara loved camping at Jan Lake and made many lifelong friends in Flin Flon. Maurice and Barbara retired to Parksville, BC in 1987 and enjoyed life there. She loved meeting new people and was genuinely interested in hearing all about their lives. In her youth, Barbara was a speedskater and competitive swimmer. She spent her summers in Matlock, MB with her family. Curling was a favorite pastime for her. Barbara was very fond of travelling and especially enjoyed New Zealand, Europe, and the Caribbean. A family celebration of Barbara’s life will be held at a later date in Parksville, BC.